This cake has plastered across many of my favorite blogs. I can't get enough— I love this cake! I told Paul if he loved me, he would attempt this cake for my birthday. Visit Omnomicon's blog for complete ingredients and cooking instructions. I love her descriptions of suitable occassions to prepare this cake—"A child’s birthday. Your mom’s birthday. Coming out to your conservative parents. Coming out to your conservative parents on your mother’s birthday. Your friend’s jam band CD release party." 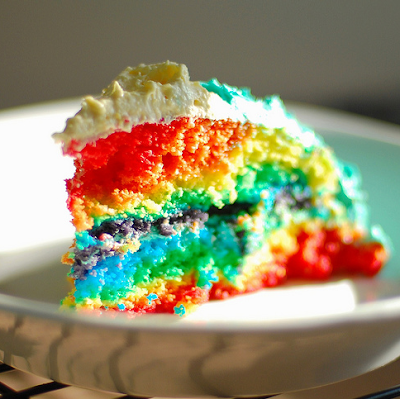 Special thanks to Jessica for introducing me to ROY G BIV cake! I can totally bake this. In cupcake form, no less.